Corporates executives across the country are admitting that they feel obligated more than ever to boost the wages of Americans as the labor market is tightened by Trump’s increased interior immigration enforcement, as noted by Business Insider. In transcripts of fourth-quarter conference calls, executives with Walmart, Dollar Tree, Target, Foot Locker, J.C. Penney, Bojangles, Abercrombie & Fitch, Ross, and Burlington Coat Factory — among others — admitted that they are experiencing pressure to raise wages in the tightened labor market. In the Bojangles quarterly conference call, CFO John Jordan specifically mentioned the tightening labor market, noting how the corporation is expecting to continuously raise wages. Dollar Tree executives said they expect “continued pressure” on wages due to the tight labor market, while Ross executives said they are planning “to make competitive wage and benefit related investments,” resulting in $11 per hour wage increases for workers. While Trump’s economic model of tightening the labor market through strict interior immigration enforcement — whereby deportations of illegal aliens living in the U.S. increased nearly 40 percent in 2017 — wage growth slowed in February. 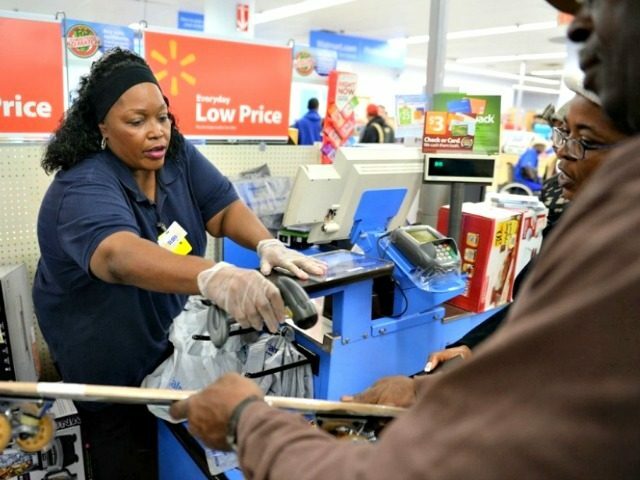 According to newly released Bureau of Labor Statistics data, wages grew by 2.6 percent compared to last year – a slight underestimate of where the Trump administration wanted to be with wage growth. Trump’s economic nationalist model has already resulted in history-making wage growth for American workers in the construction industry, the garment industry, for workers employed at small businesses, and black Americans. For instance, the massive importation of low-skilled foreign nationals to the U.S. has translated to a cheap-labor economy that has aided in keeping American men’s wages stagnant for at least 44 years, as Breitbart News reported. Median earnings for American men working full-time were actually lower in 2016 than they were in 2007. If the system known as “E-Verify” were nationally mandated, as Trump’s administration has called for, employers would be barred from hiring illegal aliens instead of Americans, contributing to more illegal aliens fleeing the U.S. labor market and thus driving up wages even further for American workers. The Republican establishment, Democrats in Congress, the big business lobby, and the open borders lobby attempted last month to kill off wage increases for American workers by working tirelessly—but ultimately failed—to pass multiple amnesty plans that would have legalized the majority of the 12 to 30 million illegal aliens living in the U.S., a move that would immediately flood the labor market.